When did the present building stand? Is there recently a renovated room? 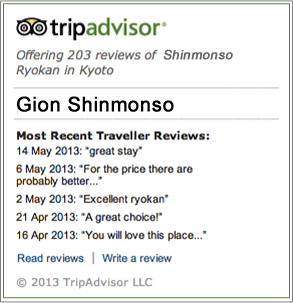 Where does the name 'Gion Shinmonso' come from? The name came from 'Shinmonmae street.' The 'monmae' represents Chionin. What is the total number of guest rooms? What is the area space? How many employees are there in total? Is there a Japanese garden in the Ryokan? How far is it by bus from Kyoto station? Go on the 206 bus line, after a 20 minute ride, get off at the station 'Chioninmae' and walk for 2 minutes. How far is it by taxi from Kyoto station? Is there a pick up bus from Kyoto station? Is the shopping area close by? Within a 10 minute walk radar, there are snack stores, and Shijo street where many shops are. In a 15 minute walk radar, there is a department store. Will you be able to hold on to our bags before and after check-in and check-out? Can you extend the check-out time? After 22:00, a night guard will be stationed. If the main gates are closed press the intercom and we will open it for you. Is there a carry service? From Kyoto station to Shinmonso, Shinmonso to Kyoto station, Shinmonso to any place in Kyoto city, we can transport your luggage for you. If you notify us before 10:00, it will arrive after 14:00. From or to Kyoto station is 750 yen. From Shinmonso to another inn is 650 yen. We have a Japanese style acupressure. The last reception is 1:00am. 4,500 yen for 40 minutes, and 6,000 yen for 60 minutes. Can request a therapist. We only accept cash for massages. What are the open hours of the shop? Are there supplies you can lend for free? Do you have rent bikes? We do not have one in our Ryokan, but there is one a minute walk away. Do you sell cigarettes and snacks? No we do not sell that. There is a convenience store in a two minute walk away. There are two computers on the first floor which you can use for free for 24 hours. You can use it throughout the whole Ryokan. SSID differs in each floor so please ask someone at the front desk. Can I use the phone in the room? You cannot make calls outside, only between rooms and to the front desk. No you cannot, but if you want to make calls in Japan, you can use the payphone in the lobby. How many types of rooms are there? All rooms we allow smoking except for the renovated rooms on the 4th floor. But before check in, we always deodorize all the room. 21 rooms are all Japanese style rooms. After dinner time or after 8pm, a staff will bring you your futons. What kind of toiletries do you supply? Are there drinks already in the refrigerator? It will be empty, so please use it the way you like. Can I take the yukatas home? You cannot bring it home and we do not sell them either. If I stay more than one night, what do I do with the futon? Leave your room the way it is and lock it when you go outside. The cleaner will come and your room will be the same as when you checked in. If I stay more than one night, do I get new yukatas and towels? What yukata sizes do you have? When are the available hours? How big are the baths? I heard people with tattoos are not allowed. I am embarrassed to go into a bath with other people. Sharing a bath with someone is one of Japanese culture. Japanese people do not care about what people think about them in the public baths. So please, we insist you give it a try. Can I go into the baths with my bathing suit? No you cannot. You must go in after removing all of your clothing. I am worried because I don't know how to go in a public bath. There will be instructions in the baths with illustrations, so please do not worry. What toiletries are supplied inside the public baths? What toiletries are supplied in the changing room? Are there yukatas and towels there? Are there any other private baths? There is a private shower booth on the 3rd floor. It is free and open 24 hours. Can other currency (EUR&USD) be exchanged here? No, currency exchange available here. I hesitate to order because it is my first time eating a Japanese course meal. In our Ryokan, if you make a reservation until 18:00 on the day before, we can prepare a course meal dinner for you. If you are planning to stay for a few days, please try our Japanese cuisines. Because of religious reasons, can I ask to take out specific ingredients? What kind of meal can I order right after arrival? You can order courses like sukiyaki and vegetarian. Once you arrive, you can decide from the menu and the prices. Can I order drinks besides dinner time? No. But we can bring drinks to your room until 22:00. How much is a stay for a child? What can be lent for free? What is prepared with a fee? I want to microwave infant food. Of course. Feel free to ask any of our staffs. Is there a baby bed? When is the best time of year to see cherry blossoms? When is the best time of year to see autumn leaves? Every year from April 1st to the 30th, 4 times a day there is a Maiko dance performance. It is about an hour performance and many foreigners enjoy it. I want to go to a Miyako odori, where do I go? In Shinmonso, we have the connection with the tea house, so we can get our customers tickets. However, once you order, you cannot cancel so please be careful. The ticket is 4,500 yen with tea service. How long does it take to get to a Miyako odori center? What should I do to go on a Jinrikisha (rickshaw man)? Is there any place I can go out after dinner? In 10 minutes walking distance is the 'Gion Corner.' Many traditional culture of Japan is performed at the Omunibasu such as Maiko's dance, flower arrangements, Kyogen, and Noh. Besides the special holidays, they perform twice a day at 18：00 and 19：00. It is 2,500 yen and there is English translation.